Belo apartamento recentemente remodelado com todas as comodidades em excelente localização. A praia de La Mata, a 30 km dos aeroportos de Alicante e Murcia. Muito luminoso e ensolarado. Localizado numa residência bem conservada com uma piscina espaçosa. Muito verde ao redor e um excelente calçadão na praia. Muitos restaurantes e bares no bairro e praia, supermercado a curta distância, mercado aberto semanal na vila La Mata. Paragem de ônibus para Torrevieja a 1 min. A pé. 5-10 minutos de carro de dois grandes lagos salgados, o Parque natural de La Mata e o centro da cidade de Torrevieja. É difícil falar sobre La Mata sem mencionar as excelentes praias, sem dúvida, algumas das melhores praias da Espanha estão em La Mata - as praias de La Mata mantiveram a bandeira azul européia por vários anos para limpeza, qualidade e segurança da água . Guarda-chuva de praia e cadeiras fornecidas. Inglês falando confortável transferência de-para o aeroporto de Alicante disponível. 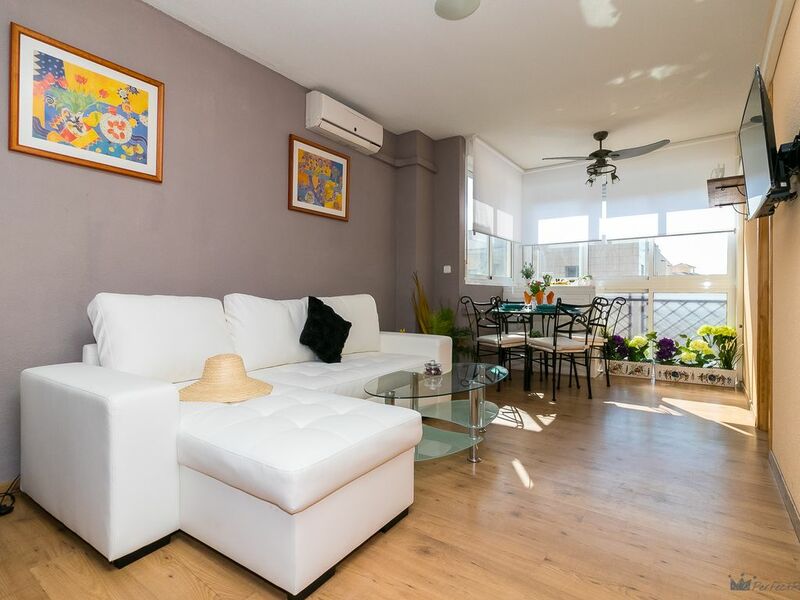 Apartamento localizado na praia de La Mata, Torrevieja, Vega Baja, Alicante, Costa Blanca Sul. É difícil falar sobre La Mata sem mencionar as excelentes praias, sem dúvida, algumas das melhores praias da Espanha. As praias de La Mata mantiveram a Bandeira Azul da Europa por vários anos para limpeza, qualidade da água e segurança. Andar de bicicleta, equitação, golfe, pesca, desportos aquáticos, caiaque disponíveis na região. Dentro de alguns minutos de carro é La Zenia Boulevard, o maior centro comercial da província de Alicante, com suas ruas, praças, fontes, concertos diários gratuitos e eventos emocionantes. Mais de 150 lojas e um parque de saúde e fitness gratuito, onde você pode se exercitar. Visite o Parque de las Naciones com seus lagos, cisnes e patos. Dirigindo para o sul em uma hora você chegar ao Manga del Mar Menor em Costa Cálida, que vale a pena ver, embora as praias não são como aqueles em La Mata. O centro da cidade de Torrevieja e sua orla também merece uma visita. We’ve had a two weeks ‘winter’ leave in this Appartement from 22/12 until 4/1/2019. Arriving in the evening we thought we entered an abandoned city but that was ‘the trick’: it wasn’t abandoned, just pleasantly quiet. It was wonderful to regularly stroll down the boulevard to the center of La Mata. And for a ‘Dutchman’ very odd to be able to swim in the sea in December for it was 20 degrees C during mid-day. The apartment was very complete with (amongst others) a handy small dishwasher in the kitchen and a neatly decorated bathroom. Located between the sea on one side, a spacious nature reserve on the other and Torrevieja nearby there are plenty things to do for almost all kind of people. I can recommend to pay one visit to the restaurant at the corner of the street where Pedro, the key-keeper of the apartment works: nice food, and pleasant service. All in all: a pleasant stay. It was a pleasure to host you. The apartment was left tidy and clean as if no guests had stayed. Nära till all service och havet. En fin bostad med allt som man behöver, även för en längre vistelse. Omtänksam hyresvärd som ordnar det mesta och finns till hands vid behov. This apartment is gorgeous and so close to the sea that I could just pad down to the beach for 20 mins in my trunks and then come back! It's about 300 metres from one of the best beaches in Europe and not much further from the nearest supermecado (supermarket). Everything was sparkling clean and plenty of options for different times of the year, heaters, fans, air-con and extra blankets. The kitchen is the best I have seen - Bosch dishwasher, very efficient fridge/freezer and AEG washing machine. The bathroom was well-equipped and the wooden floorboards make a nice change from cold tiles! There is a chemist just across the road, and I really recommend the Aqualina restaurant only about 50 metres from the apartment. Great food and reasonably priced. Alex,herself, was keen to provide me with any help she could, and I found her to be an excellent host. I recommend this apartment to anybody. It has been such a pleasure to host you!! Communication has always been very easy and immediate. I am so happy that you enjoyed your stay, Thank you for leaving the apartment in good condition. You are the ideal guest. Rates are subject to changes until reservation is confirmed. Babies are considered are to be included in the reservation as one paying guest. Maximum number of guests: 4 No pets admitted. No extra guests which are not in the reservation will be admitted unless announced in advance. Guests are required to leave the apartment clean and tidy at the check-out, emptying the refrigerator of all foods and garbage.. Should the apartment not be found in clean conditions, the guest may be required to pay a certain amount. Optional weekly cleaning : Eur 20 for 2 people and Eur 40 for 4 people, to be arranged after reservation. This includes changing the bed linen and towels. You are requested to strictly turn off air conditioned, heating and electrinc applicances as you leave the apartment. The air-conditioned plastic bottles are to be emptied as they get full. The laundry and wet clothes are to be hung at the terrace, taking the lift to the last floor and a few steps up. The key to the terrace is in the bunch of keys you receive at check-in. The view is very beautiful from the terrace.